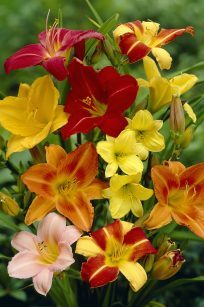 Daylilies are a perfect for large plantings, banks, or any spot in the garden that needs bursts of color. This mix contains all the popular colors, pink/white, pink/salmon, red/yellow, yellow, green/white. Easy to grow, very little maintenance and resists pests and disease. 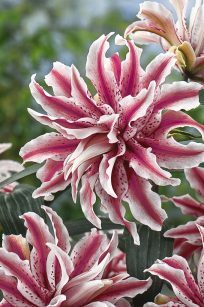 Add a touch of the tropics to your garden with the Bloomsz Double Flowering Fragrant Cut Flower Rose-Lily Bulb Blend. Five to six flowers with double and sometimes triple sets of ruffled petals bloom on each stem. Flowers up to 10” in diameter in elegant classic white with subtle pale green centers, rose pink with white tips and dark speckling, and pink banded in red with darker red speckles are borne on strong stems. Excellent focal points in cut-flower arrangements and bouquets. 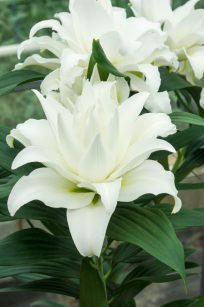 These Lilies have a beautiful fragrance and showy white flowers that make this perfect for both the gardens and cut summer bouquets. Huge, trumpet-shaped blooms are an white with double petals and are pollen free. Perfect for borders and naturalizing—gorgeous, perfumed bouquets are an additional benefit. Not to mention loads of visiting butterflies. An economical way to jazz up your garden and a fine selection for cutting, these will perfume an entire room with their sweet, spicy scent. They have long been prized by florists and gardeners alike—these perfumed, big 8″ blooms are the effortless way to put on a dramatically beautiful show. 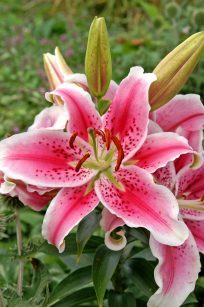 The most famous lily, the stargazer is fragrant, has beautiful upright bloomsz, easy to grow, and has strong stems that makes it perfect for a cut flower arrangement. 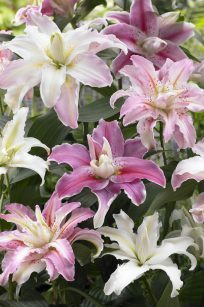 Their brilliant pink petals are abundantly freckled with dark pink and feature snowy-white edging. 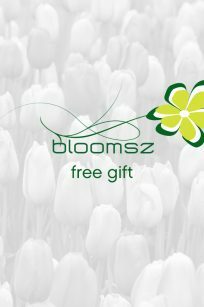 There is no better way to bring color, fragrance, and beauty to the garden than with the Bloomsz Trumpet Lily Bulb Collection. 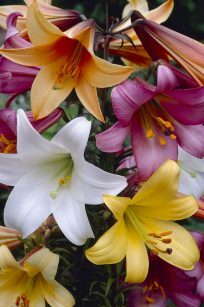 Large, trumpet-shaped flowers in shades of white, yellow, orange, pink, and lavender are highlighted by graceful green foliage. 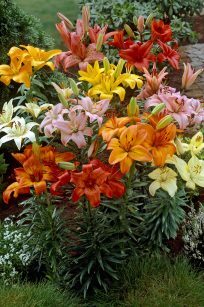 Trumpet Lilies can also be grown successfully in containers on patios, decks, and even on balconies in urban high-rises.